This is a short book on purpose, do not mistake its short length for a lack of content. Why buy a 100-page book when a 50-page book will do? Spend less time reading, and more time improving on the LSAT. 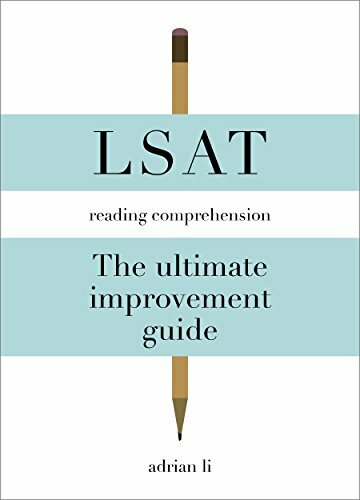 This guide was written to help those who are feeling stuck with their performance in the Reading Comprehension section of the LSAT. The author utilized the techniques in this book to achieve a 20-point increase. Making significant improvements on the Reading Comprehension section is notoriously difficult. This guide offers a comprehensive framework to help you efficiently achieve the goal of obtaining a high score on the Reading Comprehension section. In this book, you will learn a reading method called Object Oriented Reading, which will allow you to read technical passages with ease. Strategies for marking up the text in an efficient manner is also another key point of discussion. A military technique for controlling your focus is also introduced as a way to maintain peak efficiency while working through the LSAT. You will also find out how to create a stress-free study schedule and how to extract the full value out of every prep-test you do. Efficiency is key, and this book aims to apply that concept to the improvement of the Reading Comprehension of the LSAT.